The First Half is coming to an end! Speaking in sporting terms relative to the 2013 Atlantic Hurricane Season it could be said that it is a couple of minutes before half time, in other words the first half of the hurricane season that matters the most to us here in Florida, or to those who live along the Gulf or Atlantic coastal USA states, is almost over. So far so good, unless you consider that the historical record shows that the most active part of the Atlantic Hurricane Season also starts about now and normally last through mid-October. So, do not broadcast the ‘all clear’ yet, rather the prudent thing to do is to pay attention, be prepared and practice mitigation! 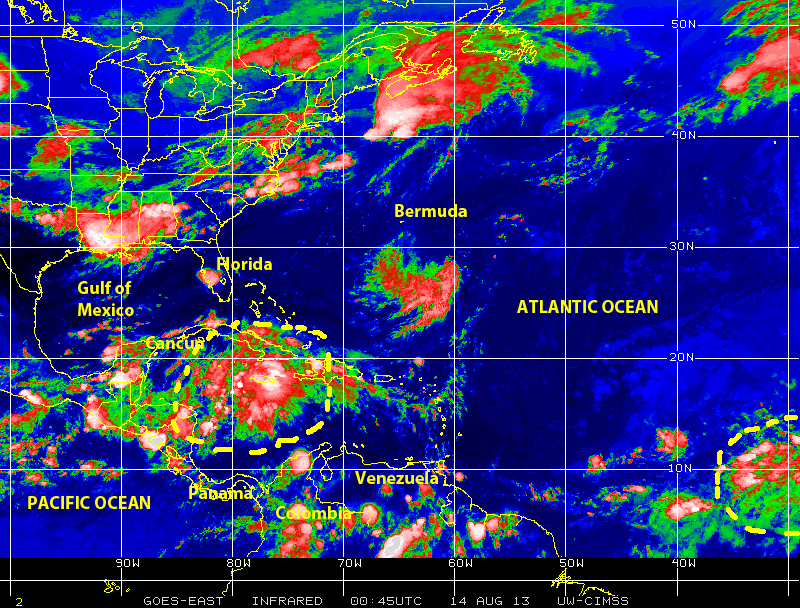 What is happening tropical cyclone-wise in the Atlantic basin on this Tuesday 13 of August 2013? There is a strong tropical wave in the Central Caribbean just southwest of Jamaica that is generating quite a bit of rain throughout the region at it moves generally westward toward the Yucatan Peninsula, which is showing some potential for cyclonic development in the next day or so as it moves into a favorable low wind-shear warm surface water ocean-atmospheric environment. All interest in the Caribbean sub-basin will do well to pay attention to this system and monitor its progress in the next 24-48 hours. Farther to the east over hurricane alley and even farther, over the eastern Atlantic near the Cape Verde Islands there are a couple of tropical waves that may warrant monitoring over the next few days as they continue to move toward the Lesser Antilles and the Caribbean. 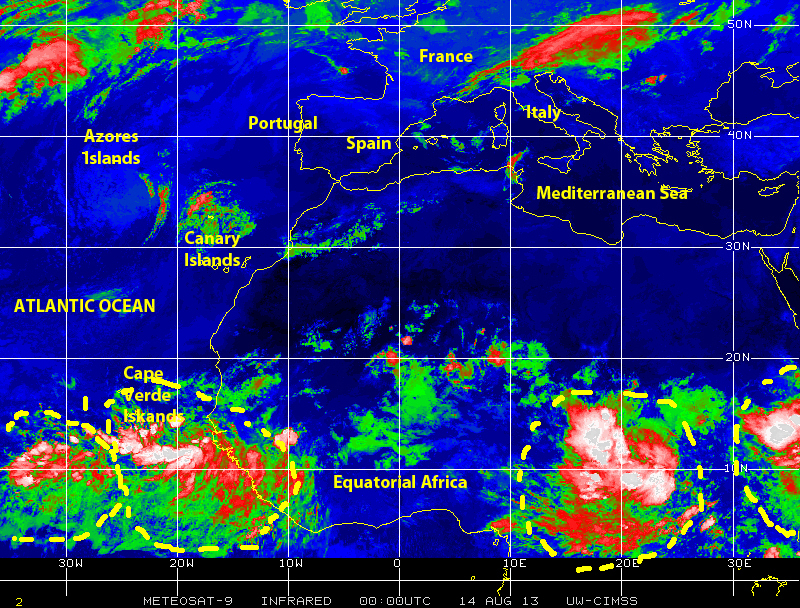 related to this on this day we also observe a train of tropical waves moving westward over Equatorial Africa adding fuel for potential cyclonic activity as they emerge over the warm waters of the eastern Atlantic. 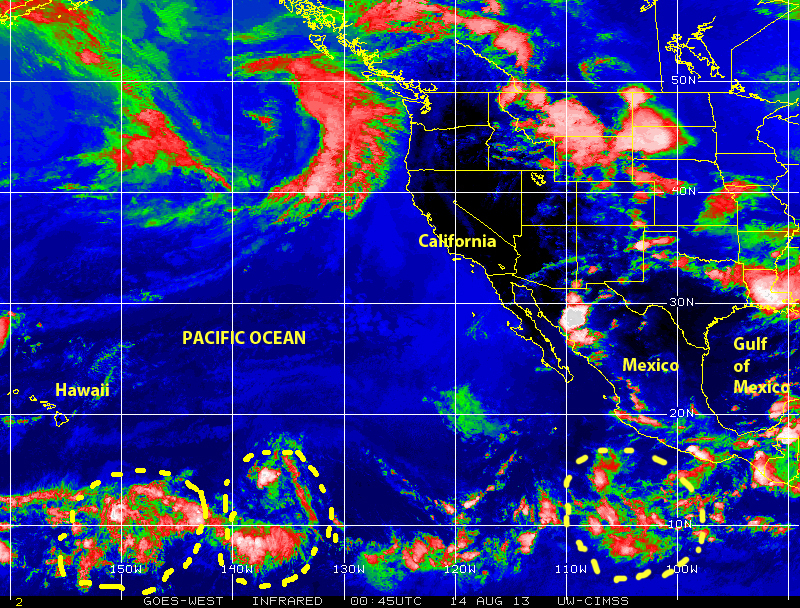 Elsewhere in the world the eastern Pacific basin has continued to maintain a high level of activity including even today, when we see a few tropical waves or cells of disturbed weather, including two that may warrant further monitoring and investigation, which are following pretty much along the same path recently traveled by tropical Storm Flossie and Hurricane Gil so all interests in the state of Hawaii will need to keep an eye on these systems now extending from the eastern Pacific toward the vicinity of our 50th state. Today also, there is major Typhoon UTOR over the South China Sea and the extreme western Pacific heading for landfall somewhere between Hong Kong and Hanoi in the next few hours after having hit the Philippines as a category 3 tropical cyclone. 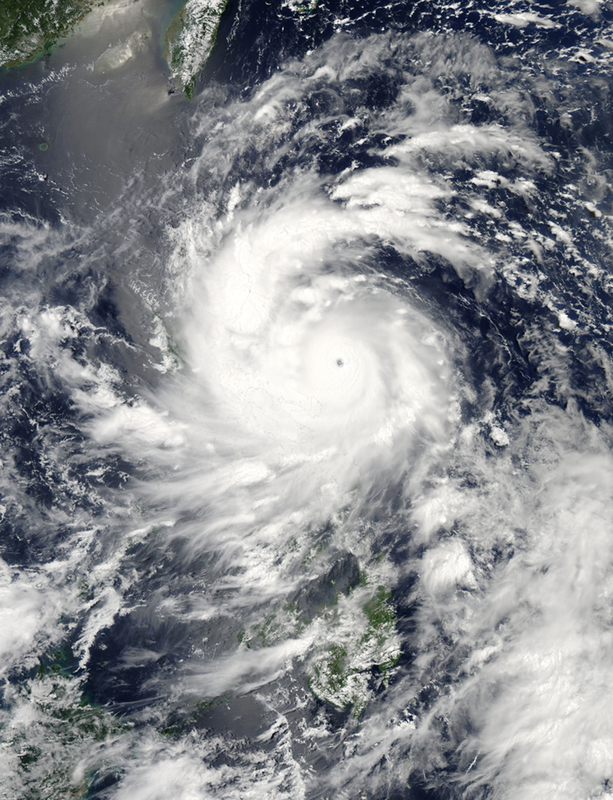 Satellite imagery from 12 August, as the storm approached landfall in the Philippines, and from today when the typhoon is traversing the South China Sea, show regions of intense rain and thunderstorms impacting a rather large region. 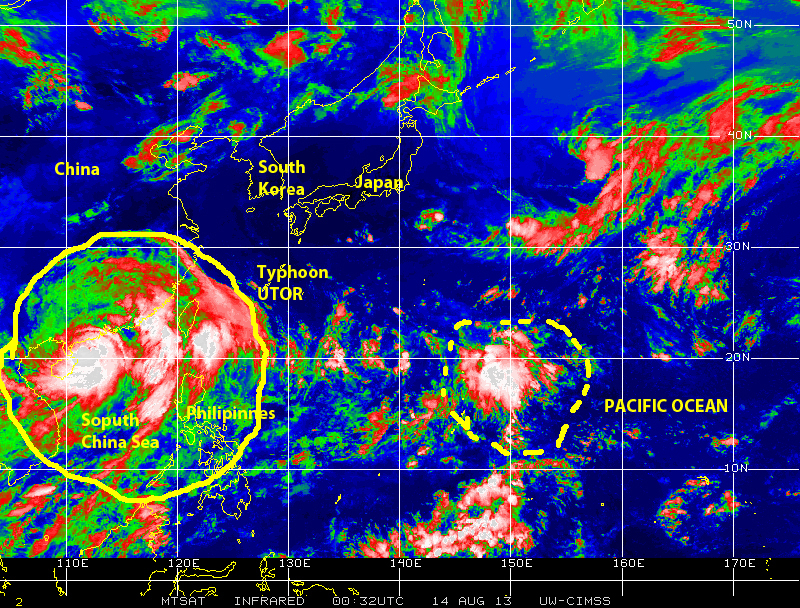 Following in UTOR’s footsteps over the far northwestern Pacific Ocean, moving toward the Philippines Sea there are a couple of cells of disturbed weather that are showing some potential for further development in the next couple of days. Residents of the Philippines and other countries in that region, which has seen a steady flow of rather wet disturbed weather cells over the past ninety days or so, must remain vigilant. This is the ‘pre half-time report’, let us be ready for whatever the second half of the 2013 Atlantic Hurricane Season may bring us. Pay attention! Be prepared!! MITIGATE!! !